The 28-year-old Mallorcan, nominated in the category for a tenth straight year, won the award for the first time since 2011 and second time overall. Nadal was also nominated for Best International Athlete, alongside Real Madrid star Cristiano Ronaldo, women’s golfer Inbee Park and Formula One driver Sebastian Vettel. Ronaldo claimed the award. Before music and tennis unite in harmonious mixed doubles, the first highlight of the tournament has already been scheduled for Super Monday on 20 October 2014. Under the auspices of sponsors Manor, Blick and L’illustré, Canada’s iconic singer Paul Anka and his orchestra will open the Swiss Indoors (5.30 p.m.), followed by the opening match between French Open winner Rafael Nadal and Australian Open champion Stan Wawrinka. Watching the world number 2 and number 4 on the same night as an overture is not something that tennis fans experience every day. 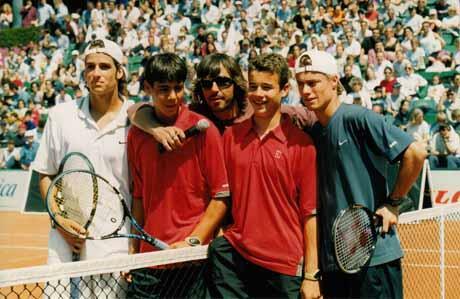 Rafael Nadal (Doha, Río de Janeiro, Madrid, Roland Garros), David Ferrer (Buenos Aires), Guillermo-García-López (Casablanca), Fernando Verdasco (Houston), Feliciano López (Eastbourne) y Roberto Bautista (‘s Hertogenbosch, Stuttgart) son los protagonistas de los diez títulos que acumula el tenis masculino español en lo que llevamos de 2014, siete meses de competición donde los nuestros han sido sinónimo de éxito. España lleva siete años consecutivos liderando la estadística de más títulos ganados en un mismo ejercicio. En 2013 la ‘Armada’ alcanzó las 17 coronas, mientras que en 2012 fueron 14, en 2011 fueron 13, en 2010 se llegó a las 20, en 2009 fueron 13, en 2008 fueron 16 y en 2007 fueron 13. El complejo tendrá una capacidad de acogida para la tecnificación de 140 alumnos internos (70 unidades) y 72 deportistas (36 unidades). En cuanto a las pistas exteriores de tenis habrá una pista principal y cuatro secundarias de tierra batida, dos de hierba y diez duras (dos de ellas cubiertas). Otros deportes: un campo de fútbol 7 y una pista polideportiva. I LOVE Rafa with or without sleeves but I think without is better!!! VAAAMOOOSSS RAAAFAAA !!!!!!!!!!!!!!!!!!!!!! He is amazing in sleeveless shirts with his gorgeous arms but I love him in whatever and look forward to seeing him play and win again! He is the BEST!! Perhaps he’ll bring back his capri pants as well. Frankly, I don’t care if he plays in his pajamas, as long as he plays his A game. VAMOS!!! Rafa looks handsome in anything he wears. I daresay it will be most enjoyable should he choose to return to the sleeveless shirt!!! VAMOS RAFA!